Hard to believe a regular voter would need or want this exhortation..
Something that came in the mail struck a wrong note. It was labeled a “personalized vote history” of the named mail recipient. And the message sounded wrong not just because of its gratuitous platitudes but because of the level of unwarranted snooping that it reveals. Platitudes? “Thank you for being a voter — voting is the most important part of keeping our democracy working,” it says. Well, it’s important but not as important as honesty, competence and devotion to freedom on the part of the people voters elect. 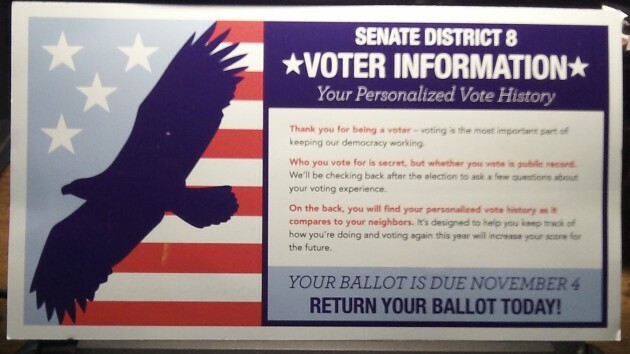 As for the “personalized voting report,” it says: “You were a voter in 5 of 5 elections, according to public records for your current address — that’s above average for your neighborhood.” The piece, a large postcard, correctly notes that whether someone has voted is a matter of public record. Still, who would be so nosy as to look up the voting history of ordinary citizens who have no involvement in politics or public life? Not just the voting history of targeted individuals but, if the postcard is to be believed, entire neighborhoods? The mailing points out that election day is Nov. 4, a reminder that you would think the senders would consider unnecessary given that a voter they rate as “excellent” on the card is most likely aware of the date. I think they send the same thing to everyone. Mine said the same thing and I haven’t even lived in my neighborhood long enough for there to be 5 elections!